Vintage Blanket toys are handmade to my own design from vintage NZ wool blankets that I have felted. 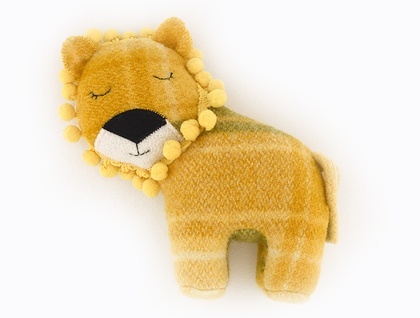 Each Lion has hand stitched sleepy eyes , a tail, and little black appliqué nose and muzzle nose. Lions can stand up by themselves and look great on a shelf when they are not busy doing what toy Lions do. Lion in the meadow has pom pom mane and is stuffed with new polyfill. 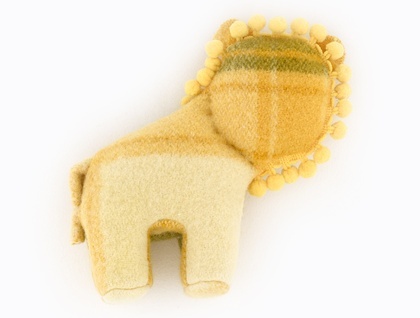 Pattern placement can vary on each lion, the position of the checks and stripes of the vintage blanket will vary slightly from the image shown. Please see my other listings for other blanket animals including Ellie Elephant, maddy mouse, blanket bears, foxes and more.